A commitment to environmental sustainability means smart goal management, new certifications and ongoing paper and plastics sector study. 19 Feb A commitment to environmental sustainability means smart goal management, new certifications and ongoing paper and plastics sector study. 2019 brings Ronpak several steps closer to reaching 2020 sustainability goals in addition to establishing more efficient facilities management, waste use reduction and comprehensive environmental stewardship. Ronpak commits itself to meet or exceed all environmental rules and regulations in the paper products manufacturing industry and to strive to protect our environment through sound sustainability management practices and decisions. Ronpak will prevent immediate and nearby pollution by striving to minimize waste generation and resource consumption. Ronpak will establish and evaluate (in timely fashion) achievable environmental & sustainability performance goals to ensure continual improvement of its commercial packaging products. Ronpak is dedicated to the practice of sound environmental stewardship and the promotion of health, safety and the well being of our shared planet and our family of employees. These values originate with Ronpak’s top management team, and are emphasized through all levels of responsibility within the company. Current legislation covering the plastics and paper commercial packaging products is constantly changing. National state legislatures are on the move, writing and voting on tough new plastic bag bans on items such as the Single Use plastic bag, which is most commonly used in grocery stores at checkout. That means that scaling up and out in the plastics industry these days is a more difficult proposition and one that’s rapidly losing its’ appeal. We all remember how Starbucks Coffee felt about their plastic straws; now with California and the rest of the West coast leading the charge, the entire plastics industry is coming under more intensified scrutiny with reams of new or pending legislation appearing in other states across the country. These current and developing legislative bans or policy changes singling out plastics are unfortunate for plastics-based industries, but on the other side of that coin, these shifts are bringing about more opportunities for paper suppliers like Ronpak. Prohibitions on “Single-use” shopping bags like the ones that you get at your typical retail store are the main driver in almost all the states working to ban plastic bags within this year – or next year. As states more clearly define their legal stance on plastic bag usage, many of the legal positions communities and municipalities will take are based upon observations of what California legislation has done in recent years. California has some of the most aggressive laws in the country regarding recycling, environmental impact, sustainability, biodegradability and compostability of commercially produced retail and foods packaging. Ray Kitchens, Ronpak’s Corporate Director of Quality, Environmental & Sustainability, attends at least five conferences each calendar year on behalf of Ronpak in order to stay abreast of the paper and plastics industry policy changes and updates with respect to environmental and sustainability issues within the industry. Some states move more quickly on enacting plastics bans or other prohibitions based in or around the environmental impact of commercial products. These sweeping changes mean the plastics industries are staying under regulatory scrutiny like never before; these new plastics legislative motions are pushing to eliminate plastic products – everything from plastic straws (like Starbucks) to even styrofoam products, but significant focus is given with respect to the ubiquitous Single Use plastic bags (typically present in a grocery checkout line). As a result of California legal precedents and other municipal changes, multiple states have already banned or are in the process of banning these single use plastic bags. Additionally, these motions have all been initiated within the last two years. As you’re no doubt aware, plastic straws have also been banned in CA, OR & WA. But for 5 cents more, you could request a paper straw. As bans continue in the service of health reforms, plastic straws have been targeted for elimination in all three states from top to bottom with additional state legislatures across the country ready to implement new laws targeting plastic straws. And even though consumers can request an alternative for a few cents more, California remains years ahead of everyone else in the “ban game”. 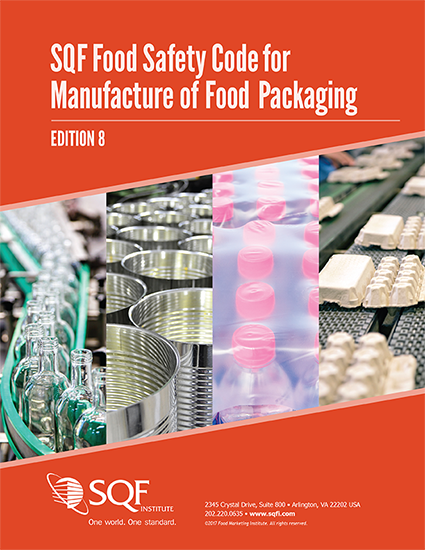 As the Quality Director for Ronpak, Mr. Kitchens gets updated monthly from the Food Service Packaging Institute with information covering new legislative issues, guidelines or policy changes that could imapct Ronpak facility operations moving forward. Even as many of these changes are being pushed by California and accepted by other states, Ronpak has been working consistently to adhere to these changing laws and successfully navigate the resulting landscape for both the paper and plastics sectors. In this way, Ronpak has made its commitment to being a better steward of the environment and continues to set goals year after year to not only meet the changing regulations – but to exceed them. Precise control at the chemical level. Several years ago, problems with (PFAS) Flouro-carbons (comprised of short-chain and long-chain PFA’s ) were raised in the supply chain. With the FDA’s declaration that Short-chain PFA’s were safe for human use, Ronpak took certain steps to ensure that no harmful PFA’s were contained in their paper packaging. Long-chain PFA’s DO cause problems in humans, but thankfully, Ronpak products feature no Long-chain flouro-carbon compounds in any of their manufactured products. In 2002 the FDA subsequently banned Long-chain PFA’s for the paper industry and the plastics industry as well. Even wood has new initiatives for paper & product manufacturers: Certified US Wood. The Sustainable Forestry Initiative (SFI) is a North American “Forest Certification Standard” & program of SFI Inc., which operates as a Non-Profit. The Sustainable Forestry Initiative is the world’s largest single forest certification standard by area. In 2005, the Program for the Endorsement of Forest Certification (PEFC; and itself the world’s largest forest certifications system) recognized the SFI Standard. Some paper packaging clients have sought out suppliers such as Ronpak who are members of SFI (the Sustainable Forest Industry) to forge relationships with, knowing that an accredited SFI Member company has committed themselves to SFI-compliant manufacturing practices. SFI conducts on-site wood audits within member facilities such as Ronpak. All paper mills and Converters are members of SFI, as major customers wish to ensure their paper food packaging suppliers like Ronpak can supply products that are Certified Wood. Only US-grown, domestic wood can qualify for this distinction. Large scale food retailers require a thorough, detailed accounting of all production paperwork in order to track each stage of Certified wood being processed from pulp acquisition to completed packaging product. Ronpak has been SFI Certified since 2015. Some food customers even conduct “Certified Wood Audits” every 2 years, ensuring each of its’ suppliers adhere to all SFI Certification and Certified Wood guidelines. NSF International is the leading global certifier to GFSI benchmarked standards, with exceptional technical expertise, consistently calibrated auditors and capacity for a timely path to certification. Most importantly, NSF certification is not a one-time event, but involves regular on-site inspections of manufacturing facilities and regular re-testing of products to ensure that they continue to meet the same high standards required to maintain certification over time. If for any reason a product fails to meet one or more certification criteria, NSF will take enforcement actions to protect you, including product recall, public notification or de-certification. Products that earn NSF certification are said to be “NSF certified” or “NSF listed” and display the applicable NSF certification mark to show that they have been tested by one of today’s most respected independent product testing organizations. NSF companies are accredited by the American National Standards Institute (ANSI-Accredited Product Certification Body – Accreditation #1181), United Kingdom Accreditation Service (UKAS) and ANSI-ASQ National Accreditation Board (ANAB), and have a worldwide network of highly skilled and experienced auditors to help organizations of all sizes implement complex food safety solutions. Millions of people take the safety of their food, water and consumer products for granted on a daily basis. Why? Because of three letters: NSF. NSF certification is your key to making sure that the products you use meet strict standards for public health protection. Choosing a product certified by NSF lets you know the company complies with strict standards and procedures imposed by NSF. From extensive product testing and material analyses to unannounced plant inspections, every aspect of a product’s development is thoroughly evaluated before it can earn our certification. 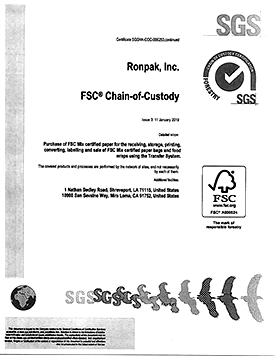 FACT CHECK: Ronpak is the only Converter that can claim each of its' US production facilities are fully SQF Certified. The competition can't. Ronpak takes our environment seriously and is dedicated to reaching the goals of environmentally sound, sustainable business practices. Ronpak receives “Letters of Guarantee” from each of their suppliers with renewed Letters required each year. Mr. Kitchens even conducts on-site supplier reviews and audits for each supplier Ronpak uses. Ronpak visits all of their raw material suppliers to make sure they are following all sustainability and environmental guidelines, since Ronpak is SQF Certified (Safe Quality Food Initiative Certified). 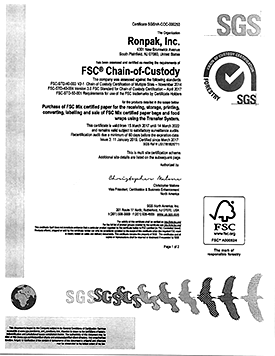 SQF Certification is also mandated by Ronpak’s customers. 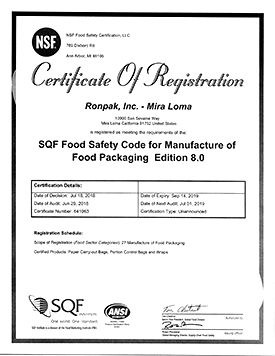 Ronpak has carried SQF Certification for over 5 years. Currently, Ronpak is pursuing ISO 140001 Certification which is a stringent set of regulations built for companies working to meet this Environmental Standard Quality Initiative. 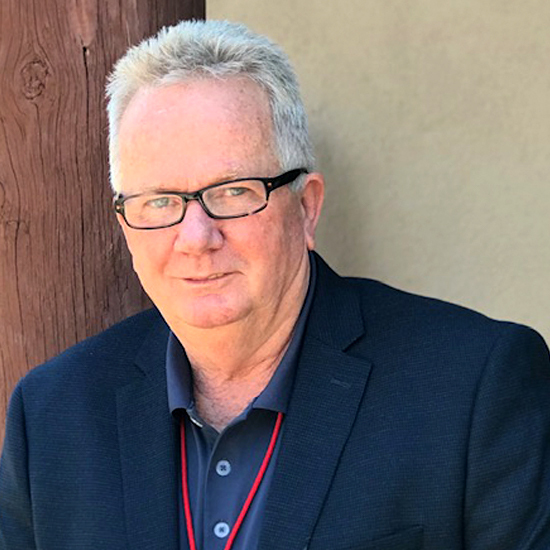 These certifying processes will start with Ronpak’s Mira Loma, California location since California would typically require the most specific and detailed adherence in which to certify. As the California requirements are met, Ronpak facilities in the Southeast (Shreveport) and Northeast (New Jersey) will follow suit. Expectations of a June 1st, 2019 SQF Certification are right on track for both Mira Loma, CA and Shreveport, LA locations. New Jersey will become SQF Certified in 2020. Further examples of the SQF Initiative would be: utilizing motion sensors on each light fixtures inside the plant, or even changing to a different constituted soap for cleaning. From Ronpak’s perspective, taking proactive steps TODAY to ensure proper environmental management just makes the most sense; it is the right thing to do and demonstrates Ronpaks’ ongoing commitment to help take care of our planet. Good sustainable practices have some additional benefits as well, such as lower insurance premiums on facility property as Ronpak continues to re-fit its’ production facilities to adhere to the SQF California Standard. Mr. Kitchens presides at all Ronpak production facilities during SQF Certification and ISO 140001 process(es). From drafting all required documentation to overseeing the processes themselves, Mr. Kitchens works to keep Ronpak certified and up-to-date. Recently, various Ronpak customers have made the decision to mandate Carbon Footprint results from their suppliers. To meet and exceed such requirements, Ronpak moved to follow the ISO 140001 Standard – a more strict, more demanding set of management from the environmental and sustainability perspective, but a requirement that will ensure Ronpak’s internal processes and record will align with any size customer. Ronpak even tests for Allergens as part of their SQF Certification requirements. Each year, Ronpak identifies, sets and meet goals listed to retain these Certifications. As foods progress from field to fork they require attention, tracking and integrity. Ronpak works to manage each supply chain step, ensuring quality, improve productivity and accountability. Agriculture and food are arguably the world’s most important industries. Ronpak clients want assurance of safety and quality at every stage of the process. Sustaining the environment is more than just good business. planet that we all share. • Meet or exceed all applicable federal, state, and local environmental, safety and health standards. • Provide a workplace free of recognized hazards and maintain healthy working conditions for all employees. • Monitor all facilities (LA/CA/NJ) for prevention of excess pollution. • Participate in recycling and compostability to the greatest practical extent to reduce impact on landfills and promote recovery of valuable resources. • Convey to our clients, associates, vendors and the public our strong environmental, safety and health commitment. • Strive to continuously improve our commitment to the above-stated principles through the exercise of our ongoing certifications such as SGS, NSF, SQF ISO 140001 & SFI, improved technology, production facility or equipment upgrades – and due diligence.